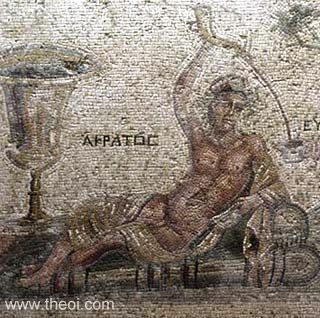 AKRATOS (Acratus) was the demi-god (daimon) of the drinking of unmixed wine. The Greeks traditionally drank their wine mixed with water so Akratos was no doubt regarded as a deity of festive excess. He was an attendant of the god Dionysos and a companion of Euphrosyne (Good Cheer). "[In the shrine of Dionysos at Athens :] Here there are images of . . . Apollon . . . and Akratos (Acratus), a daimon attendant upon Apollon; it is only a face of him worked into the wall." "Polemos says that in Mounykhia (Munychia) [in Attika] honours are paid to a hero [or daimon] Akratopotes (Acratopotes, Drinker of Unmixed Wine), and that among the Spartans statues of heroes [or daimones] named Matton (Kneader) and Keraon (Ceraon, Mixer) have been set up by certain cooks in the public mess." Other references not currently quoted here: Polemo Historicus 40 (Keraon and Akratopotes).